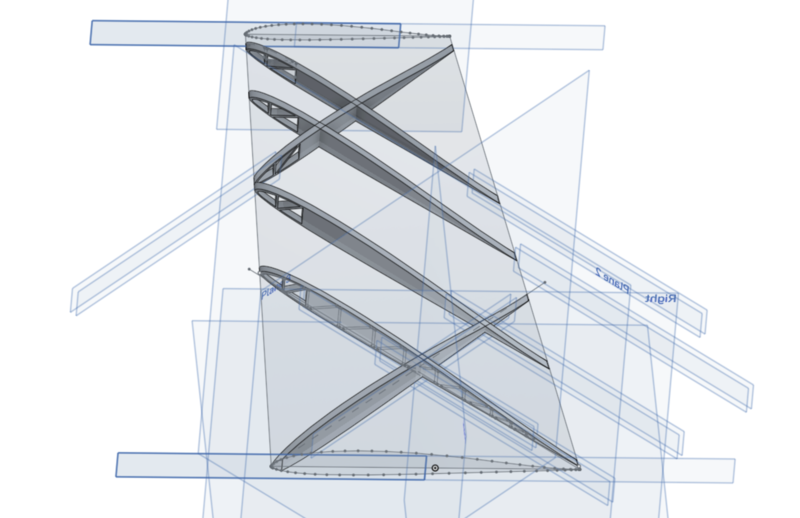 I have created two scripts for the rapid generation of aerofoil profiles in OnShape, I have been using my first script for quite a while and seems to work well for me and thought it was about time I shared it with others. Selecting the leading and trailing points does two things, its defines aerofoil orientation and also cord length. NACA XXXX allows the user to define a four digit aerofoil, I could have imported CSV's and generated from these however thats a lot of files. Therefore this script calculates the profile based upon parameters, however unconventionally allows non integer numbers thus expanding use of the 4 digit system. Below are a few picture that show the scripts in use, I look forward to aerofoil profile requests and allow I am open to Ideas on how to expand existing capability. An early wind turbine blade, using NACA XXXX and the public 3D spline script. A wing with winglet, also using NACA XXXX and the 3D spline script. I'll have to play with the 3D spline script, looks like it made a nice bend around the winglet. BTW: When I look at your shared example, it is not functional for me. Thank you for your comment! I have hopefully sorted this out now so the example should be working. 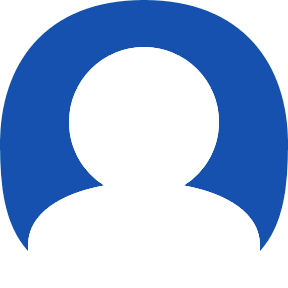 I have added the profiles you were after however I should have mentioned that this script doest work well with open profiles therefore two of your profiles currently plot a curve without a selectable face, I'll start thinking about a fix for this. Did a quick look, and was able to use the scripts. Adding the flip option on the NACA generator will be useful as well. For some ideas take a look at Qblade. Hi Duane, Yes I see what you mean about the flip. I think I used a work around by adding a negative to the camber digit. But ill look at adding flip as its more intuitive. add the 1st point as the last point, this will be smoother however there will be a bit of length added. Which do you think you would prefure? Yes and it is free. Qblade has a foil generator and has tools to modify them, or create a foil from scratch. It works well to compare foils and performance using the basic CFD analysis. On the trailing edge, I think adding line between the points will suffice. The two points are very close together. Hi guys just so you know I have now added a multi spline tool which essentially splines and lofts between aerofoils. 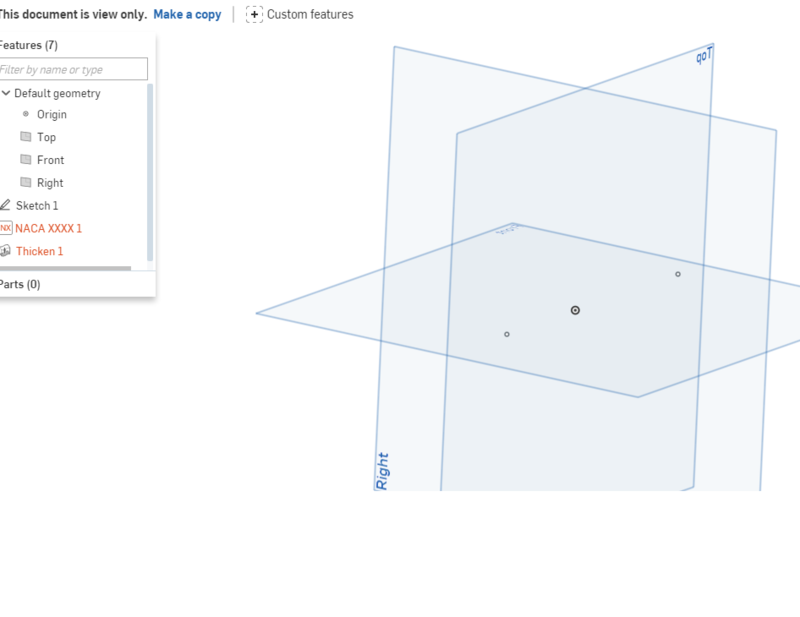 You can define the accuracy to have up to 1000 splines per edge then loft using these as guides. Ill shorty update the documentation and add an application example. Hi guys, Just so you know I have now documented the Multi Spline feature. 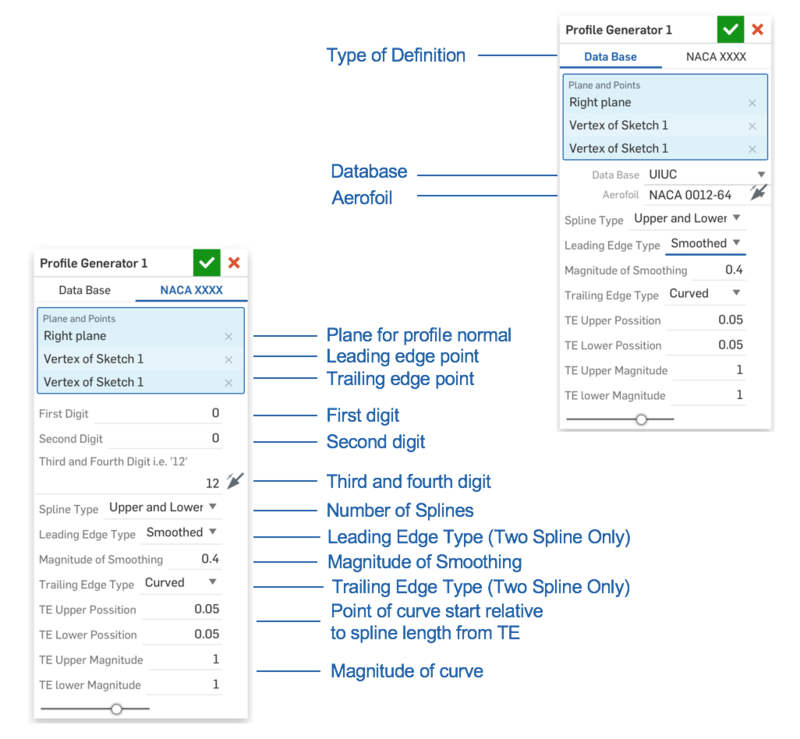 I have also updated NACA XXXX to have a default profile of NACA 0012 so that a user can define a plane and LE/TE edges and see what it looks like without needing to input all digits, this is implemented but not documented. I have also add flip into the NACA script as per @duane_1 request. Im looking at closing TE's in the profile generator script next. ps. you will need to update the linked document to see changes, I recommend you do this but leave the already used script's un-updated as the changes may have minor impact. Darren could you please add aerofoil HS522 to your profile generator. 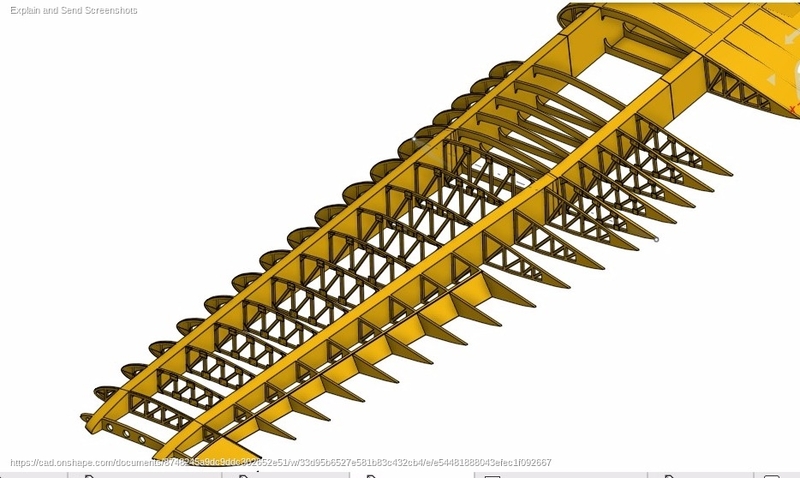 I have had a go at modifying my own copy https://cad.onshape.com/documents/58617bcbcec3fd1081e6dda0/w/14c073fff5640d9c20af40b5/e/b5fd615c46ab7c3bd8b3caf9 . Morning @david_fisher031, thanks for providing me a link ill get this done asap. Hello David, thank you for your excellent work on this custom feature! Could you add the following eppler foil profiles to the profile generator feature? The links are the selig format dat files you've requested. If so you should be able to find it in the list, I realise at the moment it is a mission to find your desired aerofoil but I'm having a think about how to improve this! If you are not seeing the above script (has both generator and NACA in the same script) then you might need to remove the script and re-add it. After I figure that out, I'll play around with changing from NACA to Eppler, it's great that's in the same feature so I don't need to rebuild the whole thing. Hello again, mine doesn't look like your menu item. I'm not sure how to remove and add it, I'll play around to see if I can figure it out. I was using a copy of your file, and adding tabs to the application examples to use the features you've created. down the page is a 'START USING CUSTOM FEATURES' video. @_5419, I took a look at your document and interesting use for it. I'm currently doing an update for this script which will allow the user to define a rounded trailing edge. So whilst I'm editing would be good to hear your feedback. I also saw you were using many 3D splines as guides for lofting, did you know that I have a multispline lofting feature for aerofoils exactly for this job? if so was it not good in your application? and how could I modify it for your needs? Firstly I just wanted to say I have been busy updating the profile generator script and I haven't had the opportunity to announce it yet... So this is me announcing "Check out my latest update!!" *Note there is a current issue with the manipulator. This is just a screen grab from the documentation, much of these options are hidden under the enums such as TE type etc, however, the types could be hidden and only produce a single spline aerofoil unless in advance mode. Or as I said leave as is. So right now If you have a preference let me know otherwise I'll leave current options in and decide wich future options are relevant. Full documentation for this is now provided, but better still see 'application example 4 - FEA' as this shows the steps taken to create the above structure. This script is new so please report any issues you find with me. There is currently only one know 'bug' where the thickness is incorrect for one of the options. Finally, I just wanted to share an insight into the direction of these scripts. Complete parametric aerofoils starting with a twin circle and twin spline type aerofoil and progressing over time. Integrated testing and debugging into the code to allow me and any user to see what is happening internally simply with an input of a string. Making 'Aerofoil functions' module public and documented for using within custom scripts. Wing structure updates to include aerodynamic features and call it 'Wing Features' or something similar (this is to adapt the script for some of my CFD work). So that's all I want to say, any feedback is always welcome. Hi @michael_stalls, these are very nice designs. (Application examples>Application example 4 (FEA)). I just loaded it and seems to work on mine, however, if you made a copy and you have linked my latest scripts I can see you would have issues. The reason being I have retired the NACA script (which the application example uses) in favour of its parent 'Profile Generator' I will update this tonight as it is very important to have this example working. for now, just explore it in the read-only document, sorry. As for multi-spline, I no longer see this as the way to go as the recently beefed loft function does very well. I use a line through the centre of the aerofoils and loft using the additional profiles thing. I get really good results here, that said if your lazy like me multispline is quick. If your still having troubles you can add me to your practice project or something and we can get it going with a basic setup. Anything else just give me a shout! Hi @michael_stalls I have updated App Ex 4 FEA with all the latest scripts, a bit of modification had to be done due to the recent changes to loft. Hi @darren_13 Thanks alot for this ! this script is great ! Some of the rc 3D printed wings have curved ribs https://3dlabprint.com/shop/spitfire-mk-xvi-s3d-cura-ready/ would this be possible to achieve with the script ? Thanks for the script it's going to save a lot of work. Hi @david_fisher031, sorry for the late response. I copied over your project and it seems I had problems when going the opposite direction i.e. on the first project I couldn't multi rib the other wing. This is a silly error and I hope to get time to fix this shortly, in the meantime, however, I found if you assign the points to be opposite it works, so by that I mean to assign the base to tip and vice versa. In response to arc like ribs, unfortunately not at the moment although it would interest me to expand the script to cater for more general use, I imagine I could do this by allowing you to sketch an arc to follow, however, I don't see me having time to do this in the near future, really sorry. I would suggest just create an arc shape solid and boolean it with the wing to get the desired shape, patterning the arc shape would allow a more automated approach to this. Thank you very much for posting, I very much like to receive feedback and see how the scripts are used, I will post again once the issue has been fixed. As an old "Slide-Rule" aerospace engineer. I'm wondering why you chose diagonal ribs in the first place. Structurally, in a full-size aircraft, the ribs carry very little of the loads. It's the span-wise spars which carry the bending loads and a leading edge "D" tube which carries the torsional loads. Those ribs just add weight. 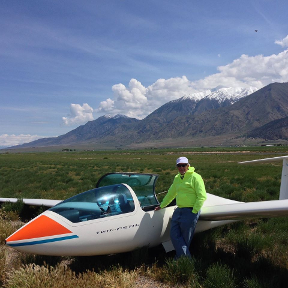 I'm seriously considering taking up the RC model airplane hobby again given the advent of 3D printing and electric propulsion so I'm paying close attention. I have been experimenting with different ways to 3d print RC wings. The best way I have found so far is to use methods similar to the methods the guy here uses ( https://3dprintedrcplanes.com/ ) I tried several methods but most were quite heavy, especially when the skin is printed. I was curious about the angled ribs until I started printing them. The wings that I have printed are printed vertically. (wingspan is vertical) When 3d printing it is nearly impossible to print horizontal surfaces (except the on the bed) without a printing a great deal of support for the surface. This support adds a great deal of time to a print that already is taking a very long time. 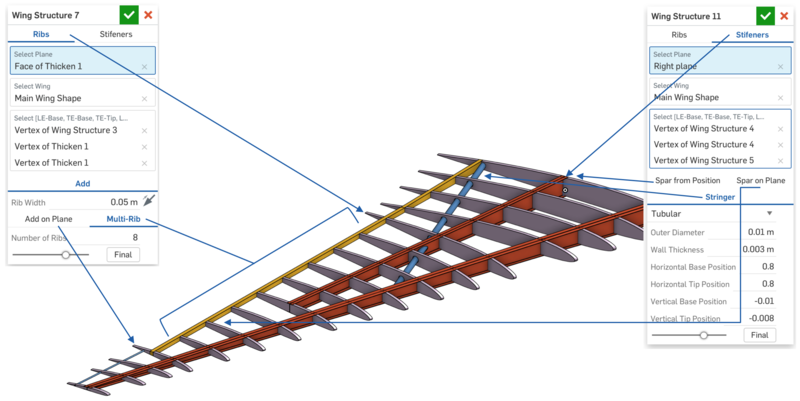 When printed the angle of the ribs allows the printing of the structure without any support. 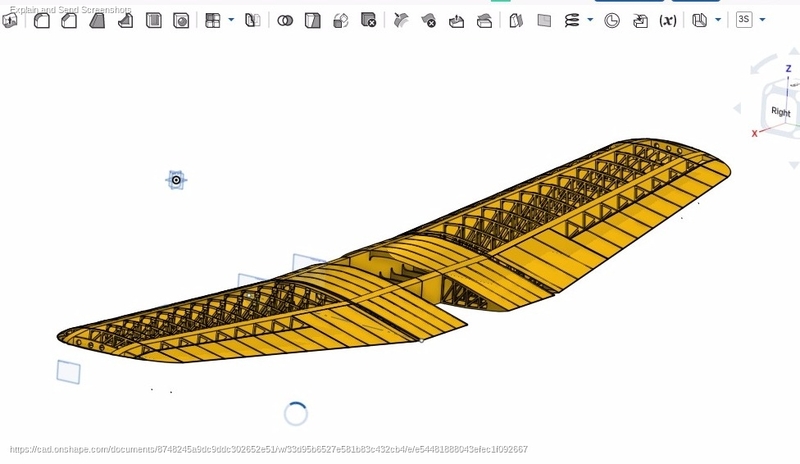 Here: https://cad.onshape.com/documents/036c42b11608e644f19f3541/w/194e03a1b72bfb9967a180ba/e/deef0361d1ef6e5782d028d7 is a test wing section that I have been experimenting with. It was time-consuming and is in need of a script to automate. Carbon fiber tube would be used as a spar. I am using Airfoil Profile Scripts to generate a rib shape that I then turn into templates for foam cutting. I need to offset the profile to allow for the thickness of the cutting wire. I am unable to offset the all or part of the profile. 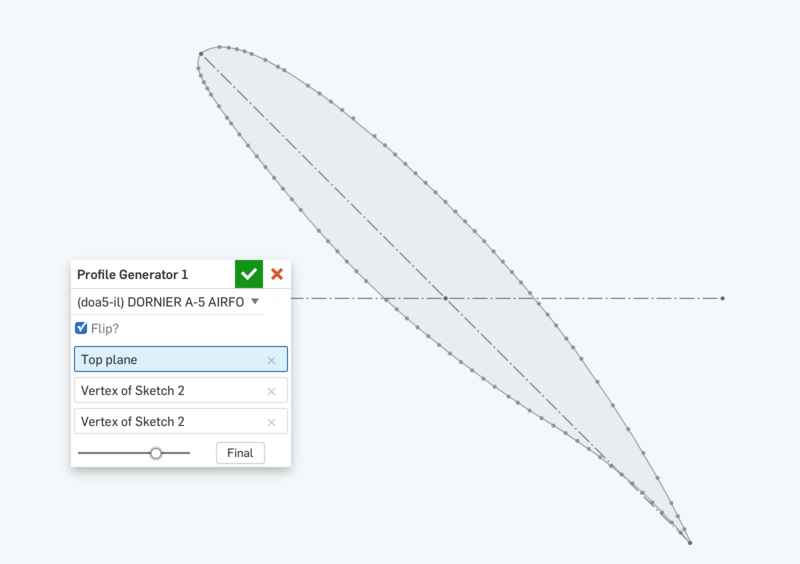 The Airfoil Profile Scripts don't seem to "return" an offsettable drawing. I consider myself a newbie to 3d modeling and may just be ignorant of an obvious solution. Would someone point me to a solution? Hi @justin_carroll, I think offsetting a sketch has troubles as you mentioned, however, if you have a solid I believe thicken works well. As for automating, where do you think automation is needed in your workflow?